After visiting England, my Hubby and I flew into Venice for the second leg of our honeymoon trip. Upon arrival at the airport, we headed to the dock and took a water taxi to our hotel. The ride was such a surreal experience as we got our first glimpse of what Venice is truly about. Each morning we had our breakfast on the hotel's balcony overlooking the Grand Canal. We enjoyed our food while people watching and listening to the Gondoliers sing to their boat passengers. The sights and sounds of Venice are truly captivating and the one-of-a kind buildings provide a magnificent backdrop. I wore this gorgeous long sleeve crochet dress (similar here) that I got from Zara a few months back. 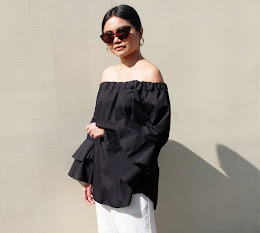 When I saw it on the rack, I immediately knew it was such a classic piece and would make a great addition to my closet. Standing on the Ponte dell'Accademia which connects Dorsoduro and San Marco. We were so pleased with the location of our hotel because everything was close by and within walking distance. Posing with my luggage. Haha Just kidding. I saw these really nice vintage suitcases and hat boxes that were on sale at a flea market and I absolutely love them! We were so happy the weather was great and it didn't rain the entire time we were there. It was a bit chilly though but thankfully the sun was out to provide warmth. Piazza San Marco, the central square of Venice, is a key tourist attraction and has such an intense energy. Its four sides house the Basilica Di San Marco, coffee shops, restaurants, art galleries, luxury boutiques and souvenir stalls. Luncheon was taken at the oldest café in Venice, Caffé Florian. It opened in 1720 and to this day, guests are still able to enjoy the classical sounds of the band whilst dining in the Piazza. Quick snapshot with the Gondoliers wearing their nautical stripes. My husband and I booked a guided canal tour later that afternoon. The hour long cruise was the best way to enjoy the famous city sights as well as the residential areas. Our tour guide was really informative and pointed out all the landmarks and their history. Standing on the famed Rialto Bridge, the oldest bridge across the Grand Canal. Venice really is a charming place and it has so much style and character. As cliché as it may sound, there really are no words to describe how beautiful and amazing this city is. Beautiful entry! I miss Venice! One of my favorite cities in Europe - definitely a standout city!!! :) Enjoy your Eurotrip! I love your outfit! So classy! I love how you put it all together! I'm in love with your outfit. It fits the scenery and you look so gorgeous.